and what will be hereafter? All things have a root and a top; all events an end and a beginning. Whoever understands correctly what comes first and what follows draws nearer the Dao. I like these quotes because they show that Above, Below, Before and After are linked together. The first quote gives a warning about thinking about these concepts, but the second, encouragement. 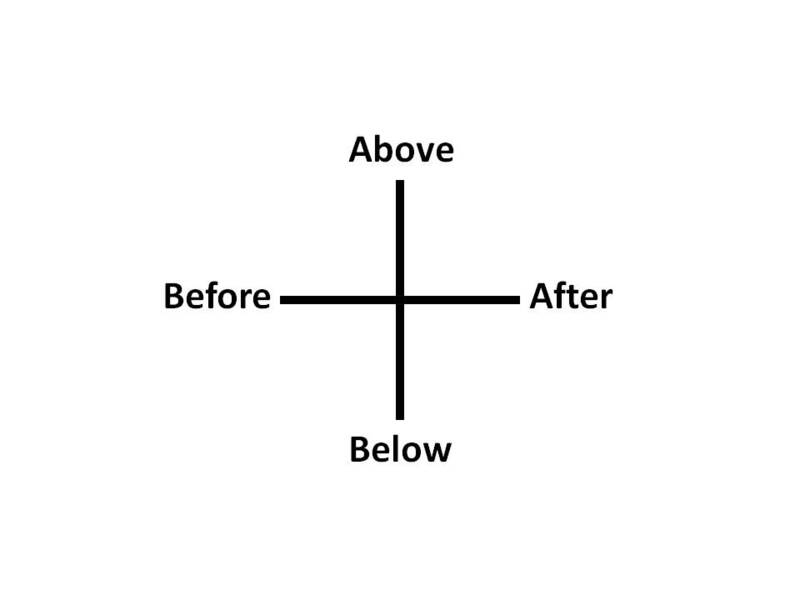 Above and below, or higher and lower, can be thought of as directions in space, but also as terms of hierarchy. Before and after can be thought of as directions in time, but also as beginnings and endings, causes and results. Every individual is situated in space and time (see SpaceTime). Every perspective is due to expression and content (see Hjelmslev’s Net). Here is space, now is time. This entry was posted on August 11, 2010 at 4:42 PM and is filed under alchemy, Metaphysics, Space and Time. You can follow any responses to this entry through the RSS 2.0 feed. You can leave a response, or trackback from your own site.